The England manager has played down the latest controversy involving his newest recruit. Southgate speaking at this evening's press conference. 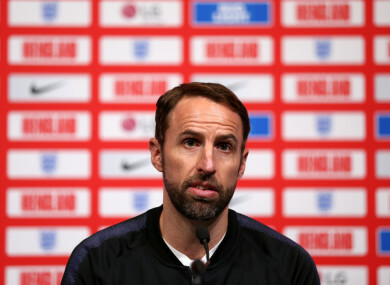 ENGLAND MANAGER GARETH Southgate expressed his support for Declan Rice after the West Ham midfielder apologised for old social media posts that appeared to express support for the IRA. Rice, 20, is in the England squad for the first time for Euro 2020 qualifiers against the Czech Republic tomorrow and Montenegro four days later having switched his international allegiance from the Republic of Ireland. Comments made on social media in 2015 surfaced today with the hashtag ‘UPTHERA’. He’s apologised,” said the England manager. “It’s not representative of what he believes and feels and his views. Email “'He was 15 or 16 in a social conversation with friends' - Southgate shows support for Rice”. Feedback on “'He was 15 or 16 in a social conversation with friends' - Southgate shows support for Rice”.